If you are new to RVing, do not try to see EVERYTHING on your two-week holiday. Limit your driving to no more than four hours a day (six at the most), particularly if you are traveling with children. Be sure each child has a set of toys and books and videos that can be carried in their own fabric bag or backpack. Remember some of the old games you used to play while driving, like checking license plates to see if you can see all 50, "I Spy," "Ghost," and "In my Grandmother's Trunk." Bring along some classic board and card games to play together as a family at night like Crazy 8's, Monopoly. It's a great opportunity to share time with your children. Stay in kid-friendly campgrounds with swimming pools. When you sight-see, remember to also visit sites that are age-appropriate for your children. And always throw in a stop for ice cream! "I got a deal on renting an older campervan. The third day the brakes seemed a bit weak going down a steep grade but when I pumped them they were fine. Then, going into Queenstown they really faded, though I again was able to pump them and stop. I thought the company had an office there so I called. They had me take the van into a Ford dealer. He removed the back tire and found the brakes had totally disintegrated. He called the rental company. They had me take the campervan back to the campground and the next morning brought me a brand new one from Christchurch (the other side of the island). They waited while we switched all our things and hauled the old one away. The driver did point out the things that were different on the new van. We had been using the other one so had a basic knowledge of how they worked." Make sure this is a vacation for the cook(s) and dishwasher(s) in the family. Enjoy simple breakfasts and lunches, but either eat dinner out or bring in prepared food. The RV kitchen for two weeks is not the place for whipping up gourmet dinners. Check out Dennis Weaver's suggestions for quick and easy recipes that are perfect for on-the-road dining. This is probably the most important section of this article. 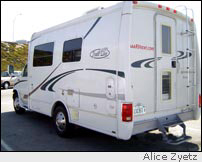 Driving an RV may be like driving a car BUT it is not a car -- it is an RV! You must respect its size and limitations to have a safe holiday. Mark Helmlinger, while doing fieldwork for NASA, has rented RVs for ten years and as a result has become an expert on the rental experience, both good and bad. The good news is that the customer service department of his rental company was always helpful in times of crisis. Of course, the bad news is that there were times of crisis. Please read Mark's excellent advice to make your trip as smooth as possible. Perhaps the best overall advice is to do a shakedown BEFORE you leave (again, see Mark's tips) to make sure everything is working properly and that you know where everything is. Most companies will give you some written instructions. Try them out before you are three hundred miles away. With careful planning and awareness of the power of the RV, you can have a great vacation. See ya down the road!